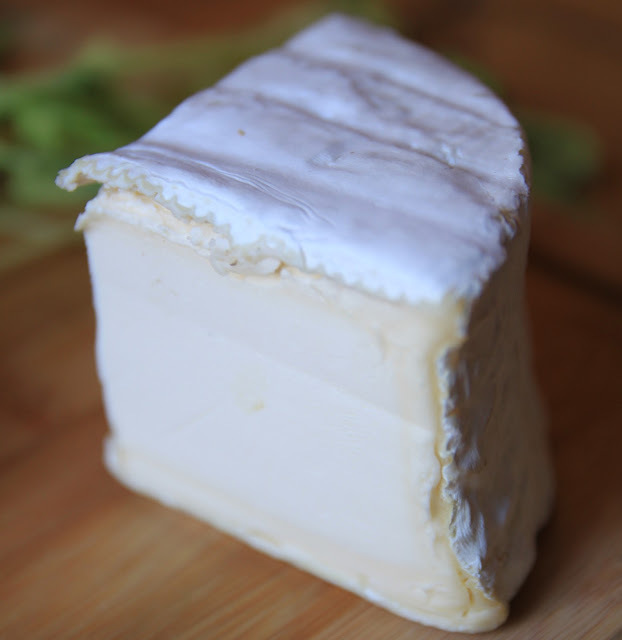 Petit Gaugry is a small cheese that is very closely related to Epoisse and made from raw cow's milk. Basically, it's a mini-Epoisse. The rind is edible, soft, stinky, and orange, because it is washed with Marc de Bourgogne (which is not a person named Mark, but rather an alcohol distilled from grape skins leftover from the winemaking process). Since it is related to Epoisse, the king of stink, this is not a cheese for the faint of heart. It has not only the distinct waft of toe jam scraped from the gym socks of a teenage boy but also a slightly bitter, acid aftertaste that some describe -- and quite rightfully so -- as slightly metallic. 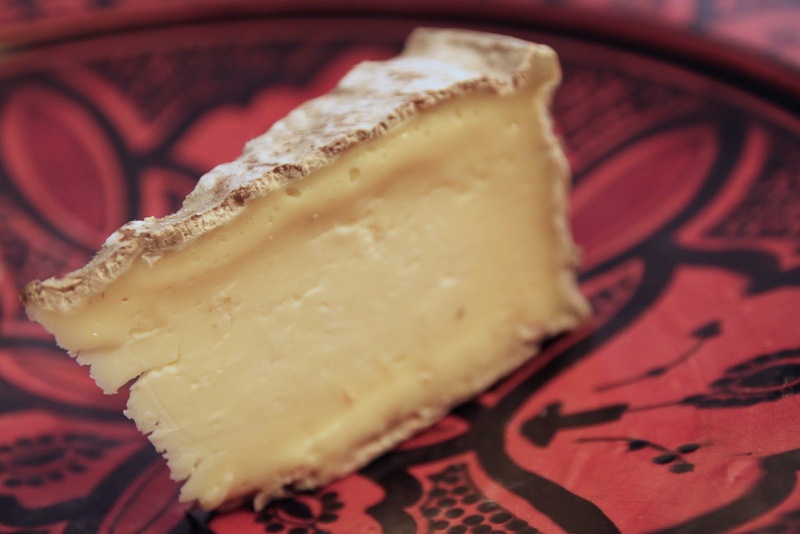 Tomme Crayeuse doesn't appear in any of my cheese encyclopedias, because it was only invented in 1997, by Max Schmidhauser in the Savoie region, near the Swiss border, as you might guess from his name. 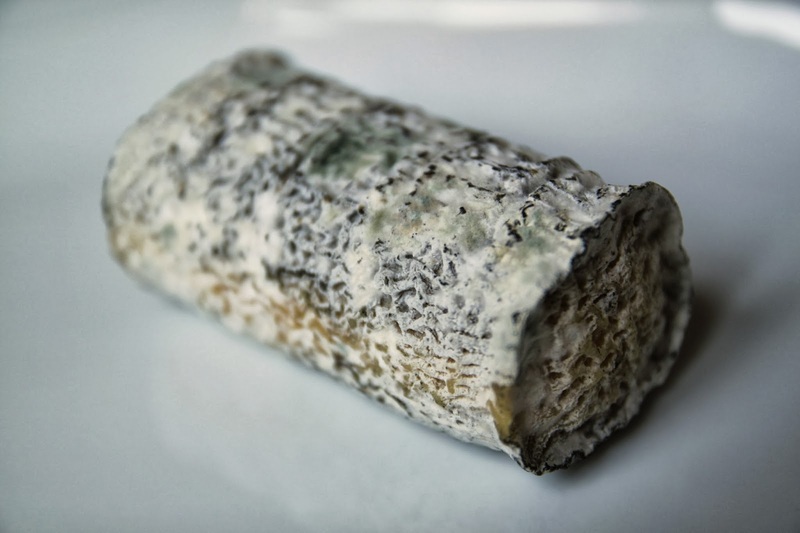 Like a Tomme de Savoie, on which it is based, it can be made from raw or pasteurized cow's milk, low- or full-fat, and it comes with a thick moldy crust of gray and white fuzz tinged with flecks of orange and yellow. It is aged at least two months, slightly longer than its Savoie cousin. Like most Parisian apartments, we do not have a dryer. Sure, we have an appliance, in our kitchen, called a washer/dryer, but the truth of the matter is that it will wash, and then spin our clothes to a state of not-sopping, but it does not actually dry. We have no outdoor clothesline, either, so this means that we hang our clothes on plastic racks to dry. Platters matter. Of course you can serve your cheeses on a regular plate, tipping in as they balance on the rims. But it seems a shame to take $80 worth of cheese and throw it unceremoniously on the table. You'll see throughout this blog the changing backgrounds of the cheeses, depending on how many I'm serving, what color they are, the sunlight, my mood. Rarely will you see a cheese photographed on a white platter because, let's face it, as cheese platters go, white is not a great choice. Most cheeses are white or off-white or yellowy-white and would be camouflaged. My absolute favorite cheese platters, collected little by little during our stay here, are the big round turquoise platter, which I bought at a flea market in Dinard, Bretagne, and the red and black platter I bought on the Dingle Pensinsula in Ireland, pictured below. Not only do they both make stunning backdrops for cheese, but I also am flooded with wonderful memories every time I use them. Santa brought me the small square slate platter, thinking it would be fun for white cheeses (and how right he was). The large bamboo cutting board also works well in a pinch, especially for large parties; the benefit of using it as a cheese platter is that I never worry about sharp knives slicing into it. The other small platters are things that were already in the apartment when we moved in, including the mirror, which makes for some interesting photos, though it's hard to clean, and I can't say I'd recommend an antique mirror as a cheese platter unless your aim is a delectable, reflectable photo. The one platter that I can't use was the one that I bought in the desert in Morocco, which then shattered in my suitcase on the way home to Paris. Greater tragedies have befallen me, but still, I was sad not to be able to serve my cheese on top of these beautifully polished fossils. Here's my newest platter -- a souvenir from a trip to Spain. We all agree that it's very pretty, but even my children are starting to look at my platters with pursed lips and a critical eye: "But Mommy, it might be a little too busy to show off the cheese." Well, we'll see when we see, but I have high hopes. The word "la bûchette" means "a little log", aptly named for this little log of lactic cheese made from raw goat's milk. It's got an earthy, farmy taste, and a wonderfully creamy texture. The inside is quite white, and the blackness of the crust comes from ash mixed with mold -- the good kind of edible mold, that is. In fact, the ends might just be my favorite part, as I love the contrast of the creamy white stuff and the slight toothiness of the crust. 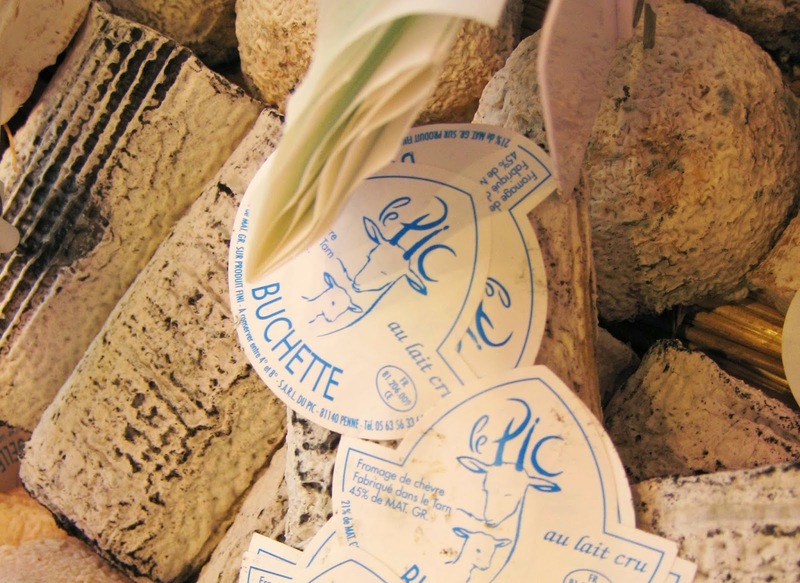 This particular La Bûchette is made by Le Pic, a large cheese producer based in Tarn in the mid-Pyrénées in Southern France. But really a bûchette in general just refers to a little log of goat cheese and is a fairly generic term, so not every bûchette will look and taste just like this one. Some might not even be ashed at all. 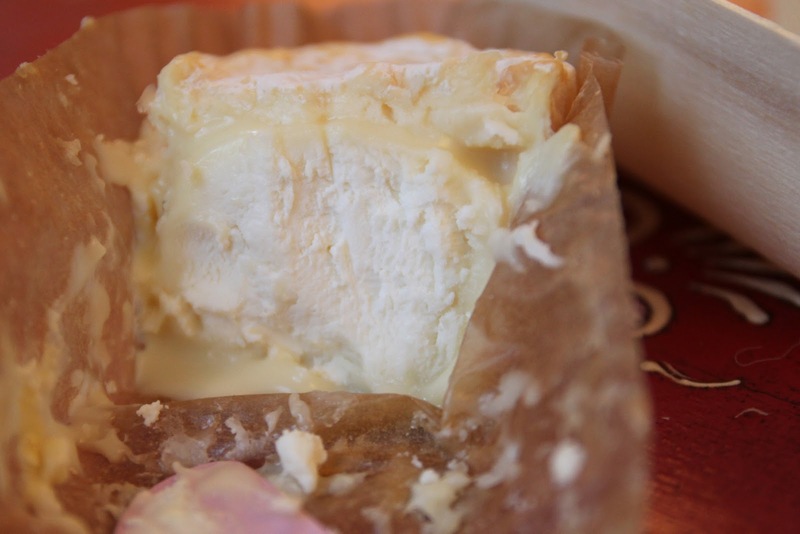 Just about the only cheese that does look good on a white platter is one that is ash-covered, like La Bûchette. The trio of cheeses (Comté, Galletout, and La Bûchette) in the photo below was served on this makeshift platter -- jury-rigged because I had to do something to let the white cheese be visible -- before I had purchased the others. 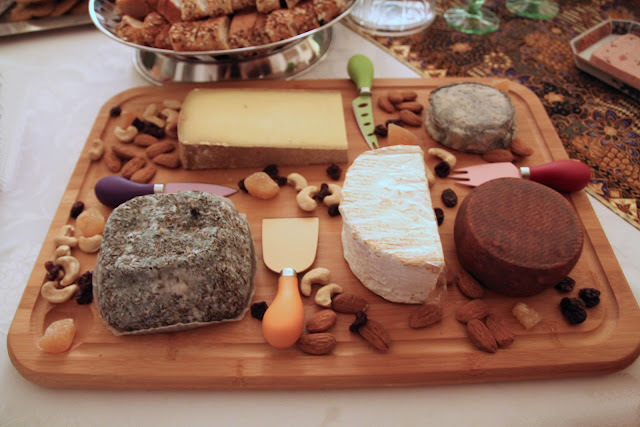 You can see why buying some real cheese platters was a vital necessity. Vital. Life or death stuff here. To my husband's annoyance, I continue to look for more good cheese platters, despite having a half dozen already. I love variety. The issue is finding a place to store all these big platters in our small-and-very-stuffed Parisian apartment. Pippa comes home from her very first day school in Paris excited to tell us "I have a best friend! I played with her all day!" "I don't know. I think it starts with a 'Sss' sound..."
And so it goes. Gigi and I still need to ask a few times to get a name right. But for poor Pippa and Anthony, neither of whom are terribly good with names anyway, it may take weeks or months. Pippa is the girl who once described her best friend, the child with whom she had played every day at school for nearly two solid years, as "that girl with curly hair." Look at these views of and from our building. Notice anything? Despite the fact that these are taken at reasonable hours -- around 9pm, at different times of year -- there are almost no lights on. We're pretty sure that the people aren't just sitting around in the dark, unable to pay their electricity bills. There is just very low residency, since it's a desirable neighborhood to own a little (million dollar or more) pied-a-terre. Down at the far end of Ile St. Louis, the Hotel Lambert is being renovated; despite the name, it's not a hotel in the English sense of the word but rather the French, meaning "mansion". The brother of the Emir of Qatari bought it from the de Rothschilds in 2007 for around $111 million, with proposed renovations that will, supposedly, roughly double the cost. Some of these were controversial, since it is a designated historical building, but he finally got approval, and work has begun. There was an issue of a medium-sized fire a few months back, but construction is still chugging along. Besides bringing back many rooms to their former glory, he's also allowed to modernize a bit and put in, among other technologies, air conditioning. I have to say, that seems barely necessary here (only a couple weeks a year), and he could've knocked fifty thousand off the construction costs right there. There's the new rich, the old rich, and the movie-star rich, all on our one tiny island. But despite our lofty neighbors (but not neighbors in lofts: strictly old-school here), we are not the only non-rich, non-famous, non-royal, non-Qatari people living here. Several of Pippa's and Gigi's classmates do, in fact, live on the island; three of them, coincidentally and confusingly, with the same given name. One of them lives on the island across the street from her mother's childhood home, where the grandmother not only still lives but also grew up. So it is a place for "real" families too. Ile St. Louis has oodles of charm, and the French themselves wax rhapsodic about it. The island has always had an air of grandeur, with mansions on the quays starting from the 17th century, when the islands cow-grazing land was first replaced with residences. 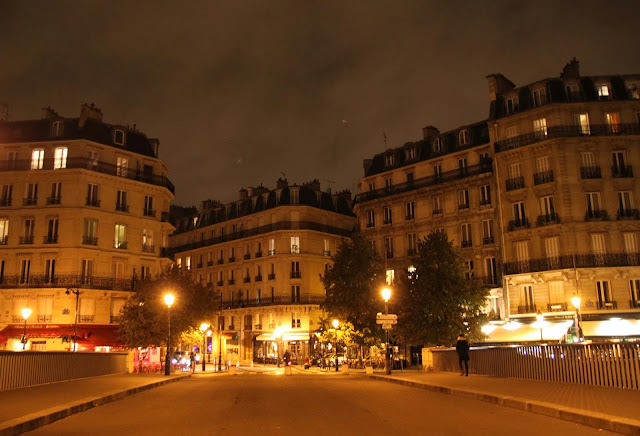 From the start, many rich and famous people have made this their home, including Charles Baudelaire, Camille Claudel, Léon Blum, Marie Curie, Voltaire, Georges Pompidou, and even, at one point, Jodie Foster. Sometimes it's actually a little embarrassing to tell people we live here; in order to de-snobbify the situation, we feel we need to qualify it with an explanation that we got really lucky, and got a good deal. Nearly every French person, upon learning where we live says the same thing, "C'est la rêve." "That's the dream." Pippa's friend's grandmother tells me that until about twenty years ago, it was not a heavily touristy island, and the shops down below were mostly little grocers. Now, besides the one or two wildly overpriced emergency food shops, it's mostly expensive jewelry, clothing boutiques, restaurants, and a few souvenir shops. The grandmother remembers before the gentrification, when it still had a rat problem (they should have visited Aurouze). I'm kind of happy the rats are gone, but if I had a time machine, I would love to go back and see it before it became such a destination. And to buy some real estate at twenty-years-ago prices, natch. But why do they sit empty? There are a few big reasons, even besides the fact the many of these owners don't need to worry about the rental income. One is that property taxes are low here, so inherited or fully-paid-for apartments do not cost much to upkeep. More importantly, if you thought it was bad to be a landlord in the Bay Area (hello, rent control! ), French tenancy laws make San Francisco and Berkeley look positively right-wing. At the moment, the law is such that nobody can be evicted, for any reason at all, between the months of October to May (the point being, it's too cold to put somebody on the streets). The current administration, much more left than the previous, had even proposed extending this to a year-round no-eviction ban. Under the current system, it is already extremely difficult to get somebody out of an apartment, even for excellent cause, and even during the summer. Everybody has horror stories to share about somebody they knew (either tenant or landlord) in a situation where even respectable, well-heeled tenants simply stopped paying, for years on end, because essentially they knew there would be no repercussions. It is slightly easier to get somebody out of a furnished apartment, which is why, when apartment hunting, one will see many "furnished" apartments that basically consist of a few junky pieces of mismatched garage sale furniture. I also think it is one reason why our own landlords were more willing to rent to us. Originally, they weren't even planning to rent their apartment, probably for the reasons listed. But we were introduced through a mutual friend, so we came recommended. Plus: ex-pats have a good reputation both for paying and -- most important -- for eventually leaving. Machecoulais is an elusive, exclusive cheese. It's so uncommon, it's not even listed in the Encyclopedia of French Cheeses I regularly consult. It's actually the creation of Pascal Beillevaire, who is one of Paris' most successful and respected cheesemongers -- a Maître Fromager Affineur with many stores around the city. Though he doesn't make all his own cheese, he does have a dairy farm in Machecoul, on the Atlantic coast, where this delicious cheese is born. Made from unpasteurized cow's milk, the outside edges have that melt-in-your-mouth-and-on-your-plate texture that makes me want to weep with joy. Even the children dig right in, and it's the first cheese gone from our platter, with a lightly earthy flavor but not so much that it covers the sweet, buttery flavor. An apartment on Ile St Louis may be a cash cow nowadays, but historically, this island was just for the actual cows: This is where the cattle from the palace -- now the Conciergerie -- would graze. There is just a hint of grass in the flavor of this cheese (and there's just a hint of grass left on the island, too...). Also, the cheese, like the island, is very, very rich, and it disappears so fast, it's practically invisible, much like our neighbors. 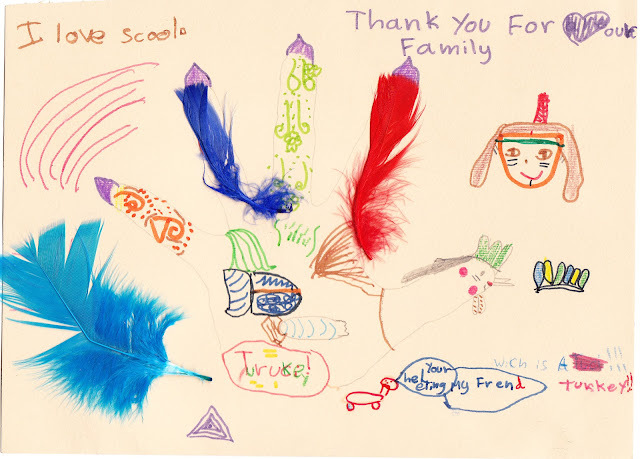 I volunteer in Pippa's class for a Thanksgiving Day presentation, complete with art supplies so the kids can make handprint turkeys. One of the girls tells her mom, my friend Béatrice, that they learned about St. Kevin's Day at school. Béatrice keeps (jokingly) wishing me a Happy St. Kevin's Day, which at first I think may be a real holiday, since every day, literally, is a Saint day in France. These pretty pears, with the tips of stems dipped in bright red wax are Passe-Crassane. Why the wax? To cauterize the end and prevent dehydration. They remind me of the beautiful $100 melons I used to occasionally receive as a gift when I lived in Japan, but less uniformly perfect. Forget about the occasional Bosc (how boring), here we buy Guyot Rosée, Comice Extra, Packam, Conference, William Rouge, Abate, and others I can't even name. There are not one but two taxidermy shops right by Pippa's elementary school. Even after two years in Paris, and with her new middle school big-girl status, Gigi still refuses to look in the windows, much less the stores. So I guess I won't be taking her by Aurouze, which Anthony and I happened upon recently while walking through the 1st arrondissement. Parisian elevator motto: Only Ride With People You Love. Let's just say that this photo of the four of us in our elevator with our backs pressed against the four walls is practically life-sized. Or, to put it another way, the elevator is barely bigger than the picture. And all stereotypes of Americans notwithstanding, we are not big people, so when we're smushed, you know it's bad. Jean-Anthelme Brillat-Savarin, a politician, musician, teacher, and writer who lived at the time of the French revolution (whose revered book with the not-so-succinct title, Physiologie du Goût, ou Méditations de Gastronomie Transcendante; ouvrage théorique, historique et à l'ordre du jour, dédié aux Gastronomes parisiens, par un Professeur, membre de plusieurs sociétés littéraires et savantes*, has been in continuous print since it was published in 1825 just before he died), once quipped that "a dinner which ends without cheese is like a beautiful woman with only one eye." And now, one way a meal might end is with this mountain of buttery cheese called, appropriately, Brillat-Savarin. Soon after moving to Paris, I chanced upon a different quote that sparked the idea for this project: After World War II, when Charles de Gaulle was charged with helping rebuild a post-occupation France, he asked (in exasperation and only half-jokingly), "How can anyone govern a nation that has 246 different kinds of cheese?" On the other side of the Channel, in order to rally British support against the Nazi occupation of France, Winston Churchill once proclaimed, "Any country with 300 cheeses cannot die!" Both of these grand gentlemen are frequently misquoted, and the numbers are often placed at 258, 360, and, because it such a convenient figure, 365. This last may also be because Churchill supposedly said to Charles de Gaulle, upon his inauguration as President of the Republic, something about how France has "as many cheeses as there are days of the year." 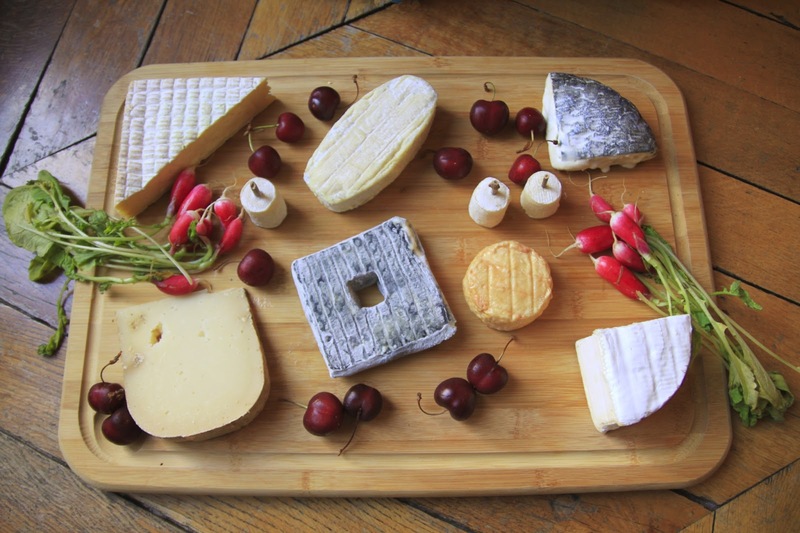 All of which got me thinking: What would it be like to eat 365 different French cheeses -- because there are, in fact, even more than that by now -- and spend a year writing about cheese and France? When I say "France" I don't mean a starry-eyed writerly Paris but rather the place my American husband, school-aged daughters, and I actually live, eat, make friends whose names we can't pronounce, work in French companies, go to neighborhood schools, do sports and activities, step around the dog poop, deal with frustrating bureaucrats, puzzle over homework assignments, and -- frequently -- find ourselves at the heart of (minor) cross-cultural disasters. So what does this mean for you? Well, by the end of this year, we will all know a lot more about French cheese, and also about life in Paris, local schools, travels in the countryside, language, culture, history, geography, and quirks and foibles. But only I will end up with higher cholesterol. When my brain begins to reel from my literary labors, I make an occasional cheese dip. It's not really a cheese for eating -- it's more for encasing in concrete and dumping in the ocean a long way from civilisation. This had to be one of the unpasteurized cheeses that were banned in the UK, presumably because, to judge by the pong, they were scraped up off the floor of the cowshed. If I had a son to marry off, I would say to him, "Beware of the young lady who likes neither wine, nor truffles, nor cheese." Cheese - milk's leap towards immortality. If you are able to introduce a white person to a new cheese, it's like introducing them to a future spouse. I had rather live with cheese and garlic in a windmill, far. Creamy, salty-sweet, an oaky nuttiness. A poet's hope: to be, like some valley cheese, local, but prized elsewhere. *Famed food critic and writer M.F.K. Fisher translated the book, whose title is as much a mouthful as the cheese, Physiologie du Goût, ou Méditations de Gastronomie Transcendante; ouvrage théorique, historique et à l'ordre du jour, dédié aux Gastronomes parisiens, par un Professeur, membre de plusieurs sociétés littéraires et savantes as the much more concise "The Physiology of Taste," presumably to encourage people to read the book, instead of getting it all from the title. Or perhaps it just fit better on the book jacket. The full translation would be more like The Physiology of Taste, or Meditations of Transcendent Gastronomy; a Work of Theory and History with an Agenda, Dedicated to Parisian Gastronomy by a Professor and Member of Several Literary and Scholarly Societies. Besides being a true Renaissance man (having played first violin at the Park Theatre in New York City and been magistrate in post-revolution France), Brillat-Savarin was also a man ahead of his time and declared that sugar and white flour lead to obesity. This raw cow milk cheese looks like the biggest, most appealing block of butter ever. And it kind of tastes like it, too. It is a creamy and delicious tower of fat (the C shaped white cheese below: C stands for cholesterol), and is much loved by everyone -- young and old -- who approaches the cheese plate. Yes, we eat the moldy crust, too. It just barely remains a solid at room temperature and oozes in the warmth of the mouth. It's a young cheese, aged only a week or two, and made with triple-cream. Triple the cream, triple the yum. The cheese is young in another sense, too, having only been created in 1930 by Henri Androuët, the grandfather of Pierre Androuët who is arguably the most famous cheesemonger in Paris. The cheese is made principally in Normandy, though it can be made anywhere. Well, it's pretty obvious. Brillat-Savarin would have loved his eponymous cheese, and it's a fine, rich, creamy way to end a meal.